Sail from the nymph Calypso back to your wife Penelope. 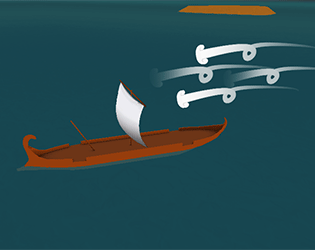 You control the ship using WASD, and the sail by using the mouse. Gain speed by aligning the sail with the wind, and the boat with the sail. Avoid sailing into land and rocks. You can find north by finding Polaris by night. To the extent possible under law, Erik Høyrup Jørgensen has waived all copyright and related or neighboring rights to Oddyseus And The Sea. This work is published from: Danmark.